Olympian, WWII Hero Louis Zamperini Dies At 97 : The Two-Way Zamperini, whose life story was chronicled in the best-seller Unbroken, survived the brutality of a Japanese POW camp after his bomber crashed in the Pacific during World War II. 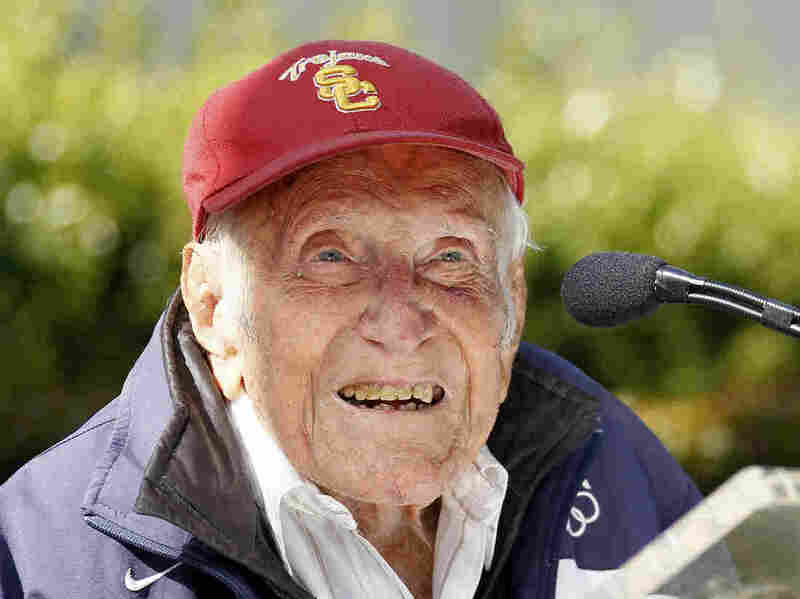 Louis Zamperini at a news conference in May in Pasadena, Calif. Zamperini, a onetime Olympic runner who in World War II survived a brutal internment in a Japanese POW camp, has died at 97. Louis Zamperini, an Olympic runner who later survived the brutality of a Japanese prisoner-of-war camp after his bomber crashed in the Pacific, has died at age 97. Zamperini's life story was chronicled in the best-seller Unbroken, and a film based on the book is set to be released in December. In a statement, his family said that Zamperini had "recently faced the greatest challenge of his life with a life-threatening case of pneumonia. "After a 40-day long battle for his life, he peacefully passed away in the presence of his entire family, leaving behind a legacy that has touched so many lives. His indomitable courage and fighting spirit were never more apparent than in these last days." Zamperini was born in Olean, N.Y., in 1917 to Italian immigrant parents. After a youth that involved run-ins with the law, Zamperini took up running and became the youngest American qualifier for the 1936 Berlin Games, running the 5,000 meters at age 19. When war broke out, he enlisted in the U.S. Army Air Forces and was sent to the South Pacific as a bombardier aboard a B-24 Liberator. In 1943, his plane crashed in a remote stretch of ocean. Zamperini and two others survived a harrowing 47 days in an open raft until washing up on a Japanese-occupied island. They were immediately taken prisoner. Unbroken by Laura Hillenbrand details the horrible conditions of his two years in a Japanese POW camp and his subsequent effort to reconcile his captivity. In 1998, at age 81, Zamperini returned to Japan and ran a leg of the Olympic torch relay. Angelina Jolie tells Hollywood Reporter that she and Zamperini had become "close friends" in recent years. Jolie, who is working on the film about his life, issued a statement saying his death "is a loss impossible to describe. "We are all so grateful for how enriched our lives are for having known him. We will miss him terribly." "After meeting Zamperini last year, Jolie, who lived nearby his Hollywood Hills home, revealed that they had 'become close friends. "Jolie produced Unbroken with Matthew Baer and Erwin Stoff. Jack O'Connell stars as Zamperini, while Garrett Hedlund also appears in the film."